I toyed with what to call these savoury pastries. I was going to call them by their Turkish name, bōrek, but was worried about confusion with the cringe-making, self-christened Kazakhstani, Borat. Can’t have that image popping up in your head when you are making these, now can I? Sorry, shouldn’t have mentioned it. And, then there’s the little matter of these being not in the slightest bit Middle Eastern. So I toyed harder. Cigars? That would cause search engine confusion for some folks, I suppose. Although they do look like big fat stogies. Oozing, delicious ones. I can imagine Homer Simpson wanting to smoke one. Parcels? I picture a bubble wrapped, leaden looking something or other delivered by chaps in a brown uniform. Maybe that’s just me. Lots of lovely foods have the word parcel in the title though, most of which involve filo pastry. That’s it, pastry. Job done. You may think of sugar-dusted puffy bits when you see the word pastry, but seeing as this is my blog I hope you’ll let me call them pastries. Naughty, but seasonal pastries. I must admit to feeling a wee bit scunnered with this recipe. Good Scottish word, scunnered, meaning ‘fed up’, although it can also mean ‘disgusted’, which I most certainly am not. Anyway, I have been making these parcels – sorry, pastries, for awhile now. They are dead simple (another good Scottish word for you; to scots it means ‘very’) and delightfully more-ish. Like a certain well known American potato chip brand, you can’t have just one. What makes them so more-ish is the inclusion of salty, savoury Roquefort. Gossamer-thin though they are, these pastries deliver an upfront dose of taste-of-the-decade umami. The word dose is entirely deliberate, for these are reviving and cheerful things to eat: shattering, flaking and restoratively good. Because of that we like to keep it simple, with only balsamic-dressed leaves and maybe a cheeky glass of white wine for company. But – ouch – I have just noticed that Waitrose’s latest ‘Weekend’ newspaper has something suspiciously similar within its tony pages. I now imagine everyone and their dog must do something similar, but better and more elegantly. Definitely more elegantly: God did not bless me with the greatest of fine motor skills. Or eyesight for that matter. But not being the easily deterred sort (us clumsy types need tenacity) I’ll just throw mine into the ring and declare it the winner. Well, certainly the simplest. I’ll settle for simplest. If you are fortunate enough to be able to get your hands on a packet of feuilles de brick pastry, go for it. Otherwise, regular filo (phyllo, fillo etc) pastry will do just fine. Brick pastry is Tunisian in origin but the brands you get in the UK tend to be French. The great thing about it is its ultra thinness. You thought filo was thin. Unlike ordinary filo, brick looks like the finest lace, with delicate criss crosses and a glowing sheen. You need only slick the meanest amount of melted butter or oil to achieve crisp, shard-making perfection. Treat it as you would filo: only one sheet worked at a time, covering the remainder with a barely-damp tea towel. The only downside with brick is that it is circular, making dinky, appetizer sized pastries a feat for mathematicians only. Address that issue by cutting them on the diagonal and piling them up on a plate. As you may have noticed I didn’t get very far with the photos. I have the making up and the baking recorded, but lack a plated and sliced version for your inspection. As is often the case with my cooking I was making these up for a group I was catering for at Maggies Centre. I should have held on until I could make these again but the good folk who ate these yesterday wanted me to write it up for the blog. And who am I to deny such a kind request. So, for everyone in the May-June “Where Now” group, these are for you. But with added shiitakes for any earthy note and some cancer-fighting lentinan. Preheat the oven to 200C/375F. 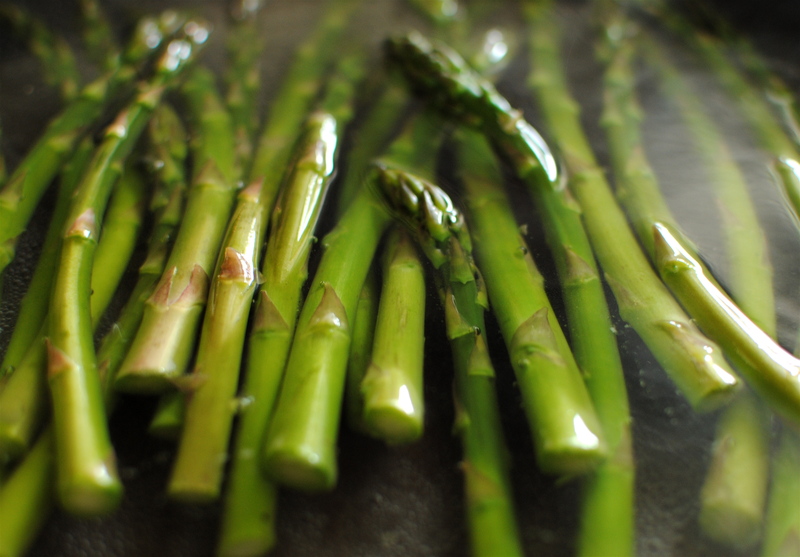 Simmer the asparagus in a sauté pan of rapidly bubbling water for three minutes. Immediately drain and refresh under the cold tap for at least 30 seconds. Drain again and lay the asparagus on paper towels to dry a bit. While these are cooling, sauté the mushrooms in oil over a medium heat until slightly darkened; spritz over the lemon juice and fleck with zest. Lay one of the sheets of brick/filo on your work surface and brush lightly with melted butter. Lay over another sheet and brush this sheet too. 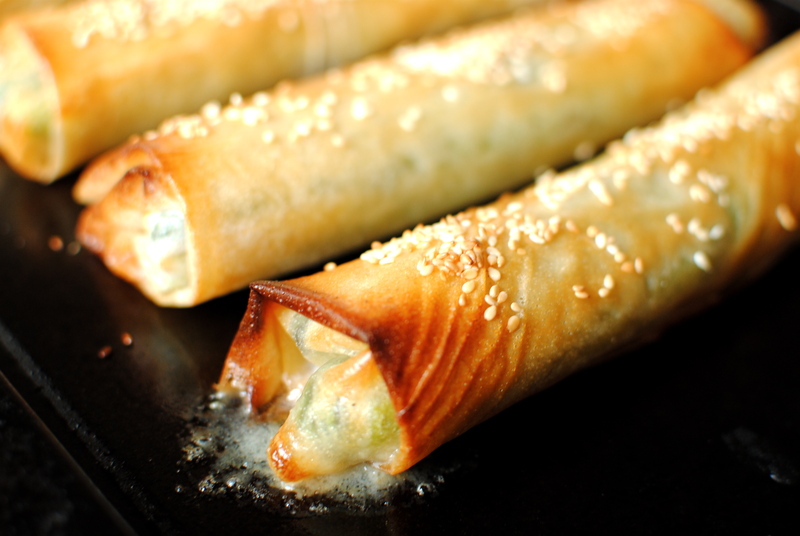 Take one sixth of the asparagus spears and place them at one end of the pastry (short end for ordinary filo). 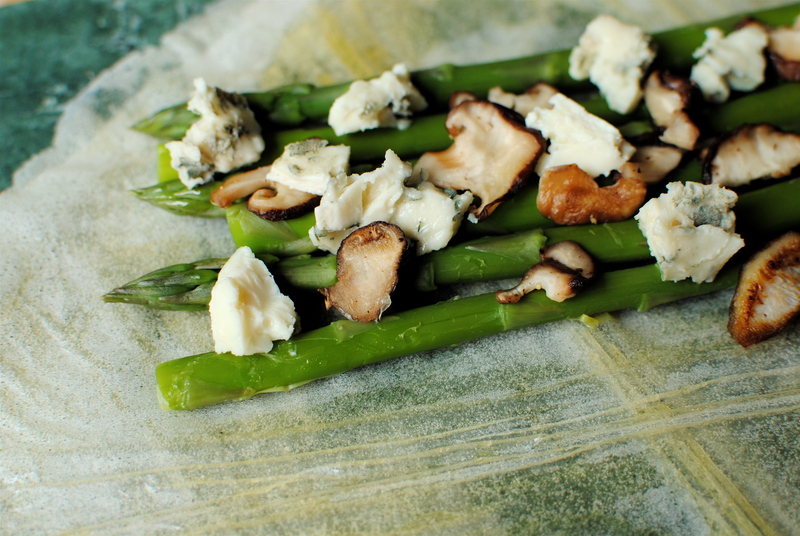 Scatter over one sixth each of the mushrooms and Roquefort. Roll the filled end one turn before tucking in the sides and continuing to roll up, seam side down. Pop the pastry onto a baking tray and sprinkle over with poppy and/or sesame seeds. 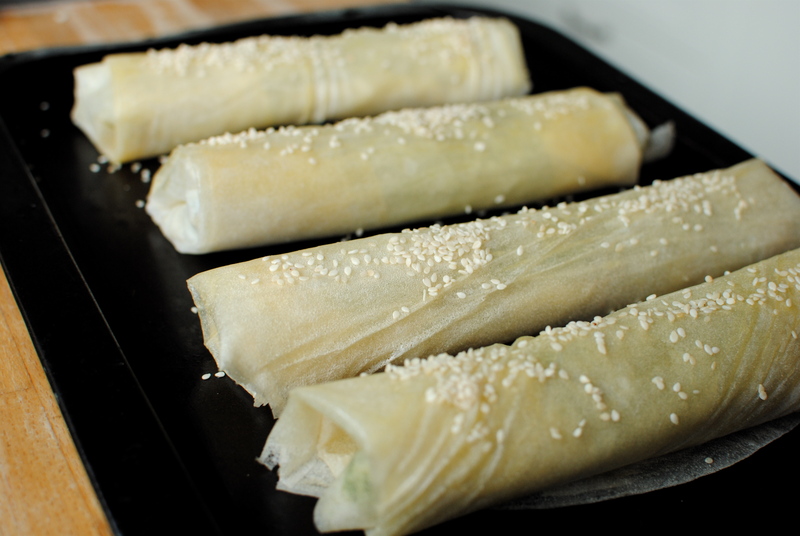 Continue filling and rolling, then bake until golden, and possibly oozing – about 15 minutes (peek at 12 minutes).